Our story began in Part One (you should probably read that first). While the main body of the High Seas Fleet left the field, the First Scouting Group had continued on its westward path. Hipper split his force when he reached the coast, with von der Tann, Derfflinger and the light cruiser Kolberg heading for Scarborough and Whitby and the flagship Seydlitz along with Moltke and Blücher steaming for Hartlepool. Von der Tann and Derfflinger shelled Scarborough for 29 minutes and Whitby for all of seven, killing 18 people and wounding slightly more than 100 between the two targets. While the battle cruisers pounded the undefended seaside towns, Kolberg laid a field of 100 mines across what the Germans assumed to be the coastal shipping lane. 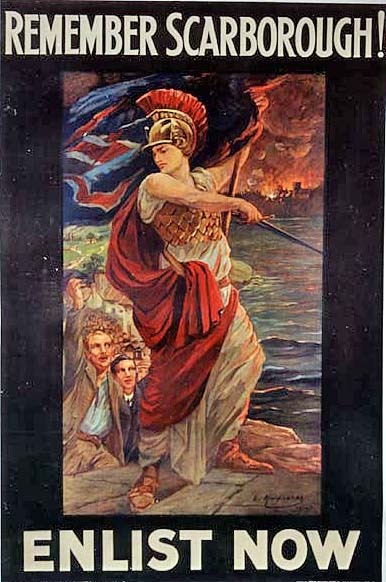 At Hartlepool, Hipper met limited British resistance. Four destroyers on patrol tried to intercept the Germans, but were driven off by heavy fire. The two scout cruisers stationed at Hartlepool and the lone submarine did little more; one cruiser, Forward, never raised steam in time to intervene while the other, Patrol, took three heavy shell hits and ran aground at the mouth of Hartlepool’s harbor to avoid sinking. The submarine – which should have left for offshore patrol when the destroyers sortied – ran aground accidentally. Those “accidents” probably saved the lives of close to 600 British sailors aboard the cruisers, which could not have inflicted any appreciable damage on the big German ships. The two battle cruisers and Blücher savaged the seaside resort, flinging 1,150 shells into the town and the nearby coast-defense batteries. All told the shelling killed 112 people (sources vary on the number) and injured at least another 400 more. The British six-inch battery defending the town managed to hit all three German ships, wounding 11 men aboard Blücher. After delivering forty minutes of hell, Hipper ordered his ships to turn away and rejoin the rest of his squadron. Between radio intercepts and reports from the scene of the crimes, the Admiralty had an idea of Hipper’s location and course. 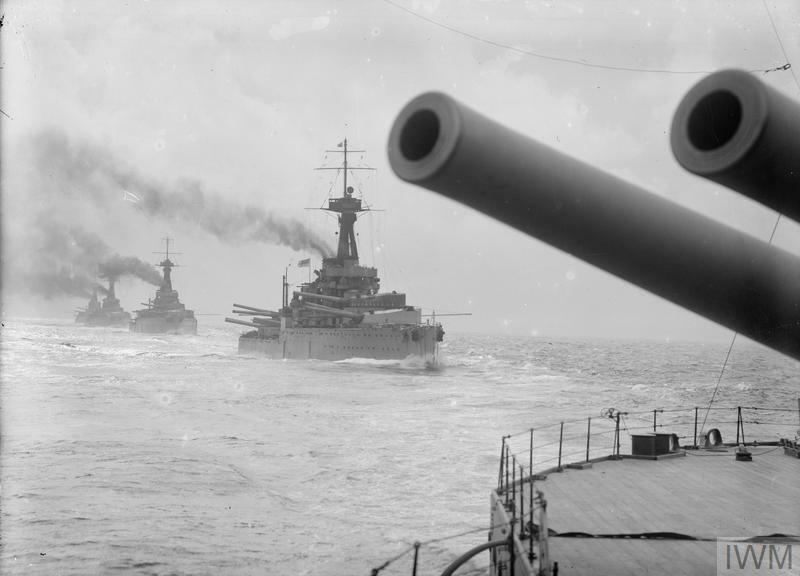 They ordered the Grand Fleet out from Scapa Flow; Jellicoe, uneasy about the entire enterprise, already had his squadrons ready for sea. They also ordered the Third Battle Squadron at Rosyth to immediately head south to block the Germans from moving northward up the coast. Jellicoe countermanded the order and had Vice Admiral Edward Bradford’s eight pre-dreadnoughts rendezvous with the Grand Fleet instead. Jellicoe had issued directives instructing British warships to remain east of a line drawn along the east coast of Britain, for fear of German minefields. Warrender directed his light cruisers to enter the danger zone anyway, shortly afterwards radioing the Admiralty to ask how great a risk they took. But Jellicoe had realized that a gap in the suspected minefields lay directly east of the bombarded towns, and he told Warrender and Beatty that the Germans would likely emerge there. The fleet commander had guessed correctly, though for the wrong reasons. The Germans had sown far fewer mines along Britain’s coast than Admiralty nightmares assumed, and Hipper had no concerns about running into them. Instead, he hoped to put as much distance as possible between himself and the coast of Britain before turning to the south-east to meet the High Seas Fleet. Had he steered straight for Ingenohl he would have passed well away from the British, but instead Warrender would have a chance to intercept the German battle cruisers. The light cruisers and destroyers of both sides labored in the heavy seas, and visibility dropped as the weather worsened. At about 1125, two and a half hours after the German bombardments began, Beatty’s First Light Cruiser Squadron sighted Hipper’s Second Scouting Group, the light cruisers and torpedo boats that had not closed for the bombardments. The light cruisers Southampton and Stralsund blazed away at each other to no effect in the poor visibility, and other ships of both sides rushed to their aid. The British cruiser squadron commander only reported the first cruiser he encountered, not the other two his spotters also identified, and Beatty did not realize that a larger German force had been contacted. When he saw the rest of the light cruisers veer off to the south to join the engagement, not knowing that his ships had sighted multiple enemies he ordered them back into their places in the screen to seek out the Germans. Instead of ordering just the two light cruisers to resume their station, Beatty’s flag lieutenant blinkered instructions for the whole squadron to resume station. The British light cruisers broke off from the action, losing an opportunity to contact the German battle cruisers coming up rapidly to join their light cruisers and torpedo boats. But as the Germans turned to the south to avoid Beatty, they approached Warrender’s dreadnoughts. Stralsund sighted the British battleships just 15 minutes after the British light cruisers broke off the previous action. Warrender’s flagship King George V did not immediately spot the German cruiser, but the flagship of his second division, the dreadnought Orion, did. Orion’s captain, the noted gunnery expert F.C. Dreyer, begged leave to open fire but the division commander, Rear Admiral Robert Abuthnot, refused, only allowing an “enemy in sight” signal to be sent. Orion and her sisters. Imperial War Museum photo. When King George V finally spotted Stralsund, Warrender did not order his ships to open fire, but instead sent his attached Third Cruiser Squadron of four armored cruisers to pursue. Dreyer would later say that “our golden moment had been missed,” but Stralsund only remained in view for 20 minutes at long range and in heavy seas. Even given Orion’s excellent gunnery, it’s unlikely Dreyer’s ship would have hit her – but she certainly could inflict no damage when she did not fire at all. Instead Warrender signaled Beatty, who turned south-east toward the German light cruisers – taking his squadron out of the path of Hipper’s oncoming German battle cruisers. When Stralsund reported the British heavy ships out of her sight, Hipper turned his own squadron to the north as he no longer needed to rescue his light ships. Figuring that Hipper had evaded him and turned to the north, Beatty did so as well thirty minutes later. Warrender came to the same conclusion a few minutes after Beatty. Hipper had been slowed by the sole light cruiser in his force, Kolberg, which had been damaged in the heavy seas and labored through them to keep pace with the bigger ships. Warrender still had a chance to intercept him, but suddenly the Admiralty began broadcasting a stream of outdated intercepts of German transmissions that placed Hipper still well to the west of Beatty and Warrender. Both turned back toward the British coast, and Hipper finally eluded them for good. More intercepts revealed that the High Seas Fleet had remained at sea to link up with Hipper, and someone in the Admiralty (likely Churchill, given the amateur foolishness of the proposal) urged the destroyers of the Harwich Force to race across the southern edge of the North Sea and attack the Germans in the darkness as they passed Helgoland. “It’s too late,” Jellicoe signaled, and in any events the destroyers had already been forced to shelter from the heavy seas; they could not have caught the Germans in perfect weather. Likewise, an attempt to send submarines after the High Seas Fleet developed far too late to see any success. Both sides had squandered opportunities for a needed victory at sea. Warrender would eventually be forcibly retired, but not until another year had passed. Arbuthnot would be the only senior officer to suffer career damage being shuffled off to command a squadron of armored cruisers. At Jutland his quest for redemption would cost his own life, those of 1,800 British sailors and three of his four ships. Great War at Sea: Jutland includes an operational scenario based on the Scarborough Raid, but no battle scenario (since no battle came from the operation). 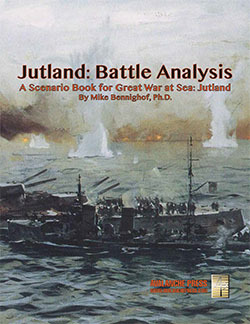 We fix that in the Jutland Battle Analysis, which has multiple operational scenarios picking up the action at different points (so, for example Hipper can try to get home with Beatty and Warrender between him and the High Seas Fleet) and many battle scenarios to break down the many surface actions that could have arisen. Click here to order Jutland right now. 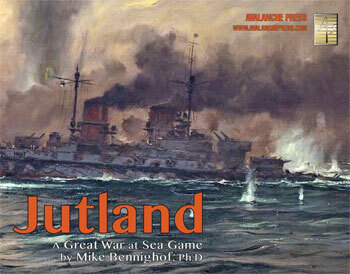 Don’t wait to put Jutland: Battle Analysis on your game table! Join the Gold Club and find out how to get it before anyone else! Mike Bennighof is president of Avalanche Press and holds a doctorate in history from Emory University. A Fulbright Scholar and award-winning journalist, he has published over 100 books, games and articles on historical subjects. He lives in Birmingham, Alabama with his wife, three children and his dog, Leopold. Leopold enjoys the occasional dog biscuit.